We’ve all done it once or twice, right? 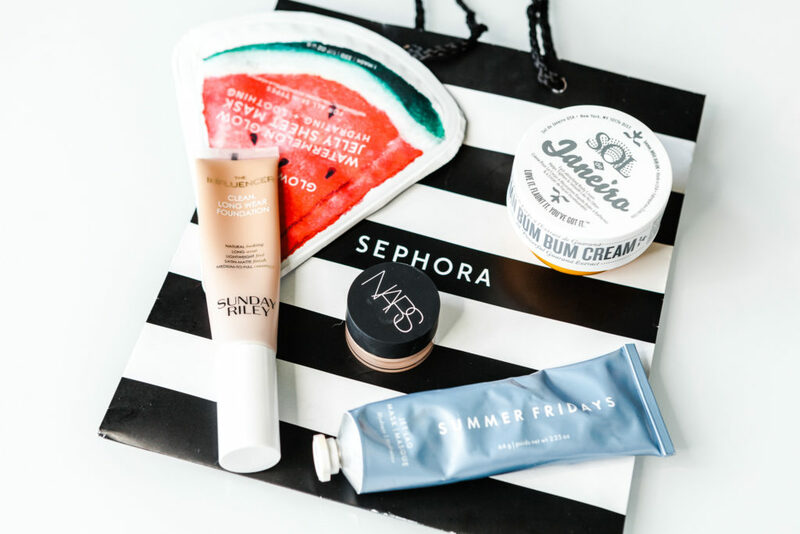 You pop into Sephora for one item, AND ONE ITEM ONLY, and next thing you know, your cart is full with a bunch of items that you certainly don’t need, but that you REAALY WANT TO TRY. So let me do the grunt work for you! In my latest YouTube video, I am sharing what I scooped up at Sephora during my last trip there, PLUS sharing if they are worth keeping or returning! Consider me your official BEAUTY GUINEA PIG! You’re the best. This was fun. I almost bought the jet lag mask but read reviews that the origins drink up mask was comparable and cheaper and I’ve been loving it! Love love love the watermelon mask and will have to try in sheet form! Yay! Thanks!!! This is my first time commenting but I’m a Dallas local and I LOVE all your content! I have been on the hunt for a natural-looking, dewy, long-wear foundation for what seems like forever, but I have naturally dry skin and am prone to breakouts (worst skin combo ever, I know!). Do you think the foundation you tried in this video would be a good choice for someone with my skin type? Thanks for all your recommendations! My skin will show allergic reactions really quickly to foundations and I can say I havent had any bad reactions to this product. I also really love anything by YSL. I love to put foundation on my skin because it helps you so much to look even more fresher and brighter. I would love to try the foundation which you have mentioned in the post.